The most significant draw of Express Entry for P.R applicants in the year 2018 and the second biggest of all time has taken over the place, with 3,900 applicants ready to get an I.T.A. The C.R.S, the cut-off limit for the September 5 Express Entry draw, attained at 440 points, identical as the prior two draws (August 8 and August 22) and the collective lowest C.R.S limit of the year so notably. As in present draws, a tie-break is utilized. As many applicants may have 440 C.R.S points, those who already have a profile in the pool longer are preferred. Especially, eligible applicants with 440 points who built their profile earlier to April 29, 2018, and those were invited to this current draw. The system of Express Entry administers the profiles of applicants in three main federal immigration categories. The Federal Skilled Workers, The Federal Skilled Trades, and The Canadian Experience Class. Such Applicants also get a rank as per their C.R.S score, and the candidates with the top rank get an I.T.A in the regular rounds. The trend of announcing 3,750 ITAs was not followed in Today’s draw. All through 2018, I.R.C.C announced Invitations in a series of draws and increased the number of I.T.As by 250/500. The Draw size was 2,750 in January 2018 and grew to 3,900 now. The regularity of big draws from June helped this score to remain at 440 and prevented it from going high. Large draw sizes and regular draws had the mixed effect of a low C.R.S score. 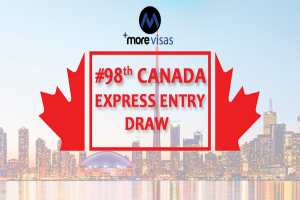 Furthermore, the Express Entry applicants can improve their scores, in various ways that result in adding 600 C.R.S points. P.N.Ps associated with Express Entry were innovative and active during the year. In 2018, I.R.C.C has declared 58,600 Invitations in 18 draws. In the first 18 draws of 2017, it had issued 57,751 of them. In 2017 completely 86,023 Invitations were issued. There are raised targets for admission in Canada in 2018/19, and more Invitations will be issued in this time. The applicants with proficiency in English language and working in management, graphic designing, scoring well in IELTS have a big chance to make the grade. Also having a relative as a permanent resident of Canada offers an advantage. The matter now is whether the I.R.C.C will continue this trend of issuing more I.T.As in the future. Do you require assistance for applying for Canadian permanent residence? If so, view MoreVisas is ready to assist you. Also, subscribe to our newsletters so that you will get updates of news related to visa and immigration.